Nelson Chamisa and his entourage (file photo). OPPOSITION leader Nelson Chamisa caused a fresh stir Monday, this time in cyclone hit Manicaland after an attempt to visit Chimanimani and Chipinge districts the epicenter of the tragedy. Cyclone Idai has left a trail of death and destruction in south eastern Manicaland in which over nearly a 100 people were reportedly killed while hundreds remain unaccounted for. Chamisa's entourage was on Monday denied entry into the cyclone hit areas by authorities still trying to access marooned villagers and provide relief efforts. According to MDC spokesperson Jacob Mafume, Chamisa was stopped at a roadblock some 12 kilometres from Chipinge. The opposition party immediately cried foul, claiming the move by authorities was a deliberate attempt to deny its leader access to distressed citizens. "We were surprised that after hearing of our trip the soldiers and police mounted a roadblock 12km from the point from which they claimed buses were sinking and refused us entry. "We were told by villagers that other cars were being allowed. Even after we were denied entry we saw some motorists being allowed to pass the checkpoint, so clearly someone gave an order to deny Chamisa entry," said Mafume. Earlier in the day the Ministry of Information issued a short statement indicating the Civil Protection Unit was appealing to the public to avoid Chimanimani. "The Civil Protection Unit wants to appeal to the general public to avoid visiting cyclone ravaged Chimanimani and Chipinge areas. Increased traffic is causing congestion that is disturbing the transportation of relief supplies and slow down rescue efforts," the statement posted on the Ministry's Twitter page said. 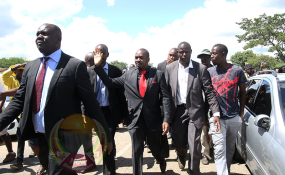 Chamisa was accompanied by vice president Elias Mudzuri and secretary general Douglas Mwonzora among other senior party officials. Added Mafume: "The people were actually happy that at least leadership from Harare was giving attention to their plight." Pictures of Chamisa in an cattle drawn scotch-cart emerged on social media late yesterday and Mafume said the MDC leader had been able to visit Tanganda and Hwengezi Growth Points a well as Nyanyadzi Hospital were some of the victims have been admitted. "President Chamisa promised villagers that he will help in terms of international attention to this very painful issue," added Mafume. Government has been criticised for its erratic response to the disaster that has also wreaked havoc in neighbouring Mozambique and Malawi. Last month Chamisa had another run-in with authorities after reportedly trying to drive his convoy onto the National Sports Stadium turf to attend a farewell concert organised in honour of late national hero and musician Oliver Mtukudzi.